BEE LIAN LAU – WHAT WAS SHE THINKING? In the absence of a clear written judgement (which was not given in this matter) complete with Bee Lian Lau J’s reasons for her decision in the Catholic Herald vs the Attroney General matter, we are reliant on information supplied to us from within and outside of Malaysia and from extracts of published media reports on this controversial decision by Bee Lian Lau J of the High Court of Malaysia. That decision being a license or permission to the Catholic Herald to use of the word Allah defies logic and reason. Handed down amid heightened inter religious tensions, controversy and a provocation of a large sector of Malaysia’s population, its Muslims the problem is compounded and more confounding where it is not accompanies by reasons. Legal reasons. That controversial decision was handed down in a week that saw the culmination of tensions rise to the boil with the fire bombing of Churches in peninsula Malaysia. (see; clause 5 of Article 11 federal Constitution of Malaysia) and a widening of inflammatory rhetoric from both sides of religion affected by the decision. Theories of Constitution and Constitutional interpretation, jurisprudence and precedent are areas of the law that Malaysian judges and lawyers alike have little interest in developing or expanding their knowledge and training in. There is a tendency amongst these officers of the courts instead to prefer the regurgitation of ancient quotes by famous English judges than for argument or analysis on substantive issues of the law and procedure on matters brought before them to be tried. The consequence of this apparent deficit of critical knowledge in areas of the law as the Constitution or the study of jurisprudence is quite often a volatile and politically driven set of judgements handed down by ill informed and poorly trained judges in Malaysia. Their decisions too often bear the stamp of partiality influenced by the legal profession’s shallow understanding of jurisprudence, Constitutional law and understanding of how the Constitution works. These problems are often further compounded by the racial and cultural polarization of the communities, infected by political considerations rather than common sense, logic, legal reasoning or an understanding of Malaysia’s otherwise workable constitution. BEE LIAN LAU-ANOTHER NH CHAN? Bee Lian Lau J, (possibly from the NH Chan school of jurisprudence) now at the shifting centre of this controversial debate over the use of the word Allah by the Malaysian Catholic Herald, has clearly usurped the power of parliament (perhaps unintentionally) in giving a new and novel interpretation to those provisions of the Malaysian Constitution that apply to this debate. Issues that concern religion and religious freedoms, speech and freedom of expression. In so doing she has clearly digressed and diverted attention from the critical and main issues at the heart of this controversy. Instead she has produced a highly controversial and unbalanced judgement, devoid of any substantive legal reasoning to underpin her decision as would be expected of a sitting judge. Little is known of this judge whom the Catholics now refer to ‘that brave judge’, others still, ‘a highly respectd judge’ (as was the cliched reference to NH Chan who expressed similar levels of ignorance of the Constitution in the Perak Constitutional Crisis). She has a Datukship, an honorific title, seen by some as a badge of dishonour and by others as that invisible tag that screams ‘government property’. What Bee Lan Liau J had failed to do and quite improperly so was to disclose her religious convictions, her emotional and religious interests in the matter she was entrusted to preside over as a judge and to declare any potential for conflict with her interests. Her duty to independence at the bench required her to disclose the extent of her commitment to her religion and the law. It is widely reported she spends a significant amount of time conducting bible classes outside of court hours (not an offence of itself). It is however a right in the public interest which goes beyond her private ‘right’ to practice her religion in peace without any interference. She is a public person thrust willingly into an arena of conflict in which she may not be independent. It is a matter likely to have compromised her judicial independence on a vexed issue in which she clearly has an interest. A spiritual and ecclesiastical interest likely to conflict with her temporal and secular duties as judge. An interest which logically may have compromised her independence and compelled her to place her religious priorities above those of the law in her mind operating against the interests of fairness in this case. The public had a right to know as did the attorney general against whom the Catholic Church was pitted in this matter. The degree of her religious conviction in this regard goes further than that of her merely practicing it in private in her spare time. Christians like any other believers adhere to a way of life that does not end after prayers. Bee Lian Lau J’s commitment to one side in this dispute (Christianity) undisclosed, raises serious questions about her impartiality and her priorities in the event of a conflict between Church, law and state. And a conflict of this nature it was indeed that she presided over. There is nothing on record to demonstrate any scholarship or seminal legal thesis either in a historic decision engineered by her in her time in private practice or in some area of the law. Her recent decision in the Catholic Herald vs the Attorney General may explain more fully why and question her credentials for the position she now holds on the bench. From what may have been an argument about rights to freedom of expression or speech, she has embarked on a dangerous adventure, unnecessarily widening issues and arguments with irrelevant additions to or filtering out those issues that go to the core of this matter. Was it her religious compass at work or her judicial training and impartiality in conflict? In failing to deal with those issues at the centre of this debate instead of creating imaginery religious freedoms and freedom of worship (as perceived to exist by many) Bee Lian Lau J has produced a controversial, and confusing judgement unhelpful for all concerned. The Constitution like the institution of the bench is as a result a casualty of Bee Lian Lau J’s legal faux pax and callous conduct as a judge. Clearly there is more than the exercise of religious freedoms here that is at the root of this highly controversial and now volatile debate that Bee Lian Lau J has missed the point on altogether. In what may well have been an unsubtle exercise of political interference and personal bias in legal proceedings, Bee Lian Lau J appears to have side stepped her professional and legal obligations to be forensic and detatched in arriving at her controversial decision last week. Clearly she may have allowed one or both of these considerations to interfere with her judgement. There is also a possible third reason for her performance. This being that she is totally and utterly unsuited and insufficiently informed in matters of the Constitution to have presided over a matter of such importance to issues of national security, constitutional and jurisprudential significance. She was out of her depth in having to decide this matter. FREEDOM OF EXPRESSION OR PROHIBITION OF A QUALIFIED CONSTITUTIONAL RIGHT? The use of the word Allah or the prohibition on its use by non Muslims in Malaysia has more to do with limitations on the freedoms of expression or freedom of speech as provided for its its Constitution, than it has to do with freedom of religion or worship as proferred by Bee Lian Lau J in her decision. If such a right does exist it is not unconditional. If there is evidence of its exitence as claimed by Catholics, it is not a constitutional guarantee but a convention. And therein lies the difference. The application of articles 3, (4, 8, 10) and 11 of the Federal Constitution of Malaysia (Constitution) relating to various freedoms, rights and those rights and freedoms to practice religion, freedom of speech and expression which to some extent Bee Lian Lau J relied upon in reaching her decision, appear to have been given very selective, very narrow interpretations and meanings. Reading it up in the process to achieve an outcome devoid of any proper or logical legal reasoning to underpin her decision. None of these provisions referred to above found in the Articles of the Constitution provide any ‘Guarantees’ to any freedoms or rights as are often argued to exist by critics of government in such matters in Malaysia. Rather these are qualified freedoms and rights are couched in language as may create rights to non Muslims and Non Malays and others at the discretion of the government and the king subject to certain conditions being met. These perceived ‘rights’ are without doubt ‘conditional’. Clearly there is and had been tension and discord brewing amongst the various races and religious groups in Malaysia over the controversial use of the word Allah by the Catholics in their weekly publication the Herald. The consequence of the Herald’ use of the word has undoubtedly given rise to a threat to ‘peace and harmony’. A condition to that ‘right’ cannot be met. This dispute concerns views and interpretations of the impact, the use of the word Allah has in particular on Muslims, when used by Catholics in their publication distributed widely to non Muslims (and aimed at potenttial converts including Muslims), that has led to the debate taking on a dangerous and sinister form in the inevitable shape of an inter religious dispute. (the peace and harmony condition is threatened). These facts are not controverted by either side to this extent. With respect to ‘freedom of religion’ (“may be practiced” which is discretionary and not a guarantee as some read it) are the qualifying words “in peace and harmony”. When read in conjunction one set of words with the other, the cautionary character of that particular clause and the meaning it conveys becomes clear. In plainer English than that in which it is written, this clause provides a discretion to government to allow the practice of other religions rather than to compel government to allow its practice or for government to guarantee the practice of other religions in Malaysia. This clause in the Constitution expressly acknowledges that Islam is the religion of the Federation. Not subject to or existing alongside any others. The Constitution in this clause is unequivocal in respect of the paramouncy of Islam over other religions in Malaysia. As to the second part of the clause (1) of Article 3 of the Constitution, the expression “in peace and harmony” , it is clear from the conditions that exist as a result of the action of the Catholic Herald’s action that ‘peace and harmony‘ is threatened and cannot be maintained (by who ever and for whatever reasons. The Constitution is silent on the point). The absence of or threat to ’peace and harmony’ as referred to in clause (1) of Article 3 again without equivocation, gives rise to a discretion in the hands of responsible government to exercise its powers in maintaining that ‘peace and harmony’. In preventing a debate of this nature from deteriorating into a conflict situation that threatens national security, political stability and civil strife, government is well within its rights and is empowered to act, even if that means curtailing the rights of some or all sectors of the community. Bee Lian Lau J clearly failed to give cognizance to or a proper reading of those words in the meaning of clause 1 of Article 3 of the Constitution. Her judgement is desultory and callous. “it was not an offence for non-Muslims to use the word to the non-Muslims for the purpose of religion”, she added. Interestingly the Constitution does not provide for the creation of an ‘offence‘ she refers to for use of the word Allah by non Muslims to Muslims in the propagation of their religion. It appears to be a creature of Bee Lian Lau J’s own imagination. Nothing more. (1)Every person has the right to profess and practice his religion and, subject to Clause (4), to propagate it. (4) State law and in respect of the Federal Territories of Kuala Lumpur and Lubuan, federal law may control or restrict the propagation of any religious doctrine or belief among persons professing the religion of Islam. (5) This Article does not authorize any act contrary to any general law relating to public order, public health or morality. Relevant to the issues at the heart of this debate and to Bee Lian Lau J’s controversial decision is, whether the Malaysian Herald has the right to use the word Allah in its weekly publication or to use it in the propagation of its religion. Even if the Constitution in this Article 11 clause (1) appears to confer that right (in clause (1) of Article 11) on the Catholic Church, that right in clause (1) of Article is qualified, restricted or subject to operation of the provisions of Article 11 clause (4). Clause (5) of Article 11 and not Bee Lian Lau J’s selective and misguided interpretation of clause (4) of Article 11 provides possibly for the creation of an ‘offence’ in breach of Article 11 which clause (4) of Article 11 does not in any manner, shape or form provide for. Article 11 of the Constitution provides amongst other things in clause (1) that every person (one would have to read that it would include a corporate personality) has the right to profess and practice his (generic) religion, subject to clause (4), to propagate it. Critical to the Churches position and to Bee Lian Lau J’s judgement is that the Church denies the word is being used to propagate the faith, especially amongst Muslims. The threat of or the actual propagation of the Catholic faith amongst Muslims is a matter squarely at the fore front of Muslim Malay anxiety a matter which no account was taken of on considered as being at the source of conflict in this debate and a potential or trigger for the exercise of a power by government under clause (4) of Article 11. Given the history of the Catholic and other Christian Churches of late to aggressively proselytize and ‘harvest’ followers from amongst the Malay Muslim communities post 9/11 (Lina Joy being but one high profile example of the point I make) it is no wonder that the anxiety of Malays and Muslims are heightened to a fever pitch in Malaysia over the sinister use of the word Allah by Catholics. State law and in respect of the Federal Territories of Kuala Lumpur and Lubuan, Federal law may control or restrict the propagation of any religious doctrine or belief among persons professing the religion of Islam. Clearly the judge was selectively oblivious to or had no understanding of the powers provided to the various states and territories in clause (4) of Article 11 of the Federal Constitution with respect to “the control or restriction of the propagation of any religious doctrine or belief”. A Matter which the Catholic Herald as a medium of the Catholic Church is carrying out or peceived to be carrying out in the eyes of a majority of Malaysians. Its Muslims. The government sees the widespread availability of the Herald (not a restricted publication) as having a distribution capability of reaching ‘persons professing the religion of Islam’ referred to in clause (4) of Article 11 of the Constitution. That power provided to the government at State, Territory and Federal level was for some reason overlooked by the judge in an extraordinary decision (oral at that) without any further explanations to it. Further, clause (4) of Article 11 does not impose conditions upon the government as to when it should or may use or apply that power at all. It is discretionary. Arguably a discretionary power in government which lies in the words “may control”. If in its wisdom (something the Bee Lian Lau J clearly misunderstands) the Federal or other government within Malaysia decides that a particular act or omission by a religious group (in this case the use of the word Allah by the Catholic Church) amounts to propagating its faith amongst Muslims, then the government has a duty to act under the Constitution to prevent its use and the greater mischief that would result from its use amongst Muslims especially not only because they are Muslims but also because they constitute a not insignificant majority in a democracy. The Catholic Herald is not restricted in its distribution and is difficult to restrict in its reach throughout Malaysia. Bee Lian Lau J further appears to have shot herself in the foot by making reference specifically to clause (5) of Article 11 which tightened the noose around her flawed interpretation of the relevant Article 11 of the Constitution and her decision in this matter. This Article (11) does not authorize any act contrary to any general law relating to public order, public health or morality. Again it is difficult to see how she could have possibly escaped the ‘act contrary to public order’ when all the evidence clearly pointed to threats to the peace in this regard. The fall out from Bee Lian Lau’s farcical and scandalous decision and the communal divisions and public disquiet that preceded it, clearly point to a right and an obligation on the part of the government to put paid to the Catholic Herald’s use of the word Allah if for no other reason then for a breach of the provisions of clause (5) of Article 11 by the Catholic Church. It cannot possibly be read in any other way. The controversial use of the word Allah by the Catholic Herald has created a situation not only likely (and now with the benefit of evidence) but expressly so to affect public order and morality. The fire bombings regardless of whoever it is who carried it out, is evidence of that public order situation that ought to have been foreseen and prevented by government at the outset. It is a matter that was brewing on both sides of the divide now for some time. Clearly this matter is not about to go away in a hurry because of a flawed decision or declaration (Whichever the case may be in the absence of a written judgement) by an inexperienced Bee Lian Lau J. She has merely thrown more fat into the fire which has embarassingly reflected once more for the public record the caliber of judicial incompetence in Malaysia. Incompetence in their decision making that is dangerous in a highly politicised and polarised legal and political environment. It is a widely held perception and a universally held one at that amongst academics and jurists, that a failure to deliver a written judgement by a judge constitutes a form of removable judicial misconduct. On such a matter of grave national importance, critical to stability and internal security in a country as polarized and divided along religious and race lines as Malaysia is, it was incumbent on Bee Lian Lau J to produce a written judgement at least on the day immediately after the date of judgement which she did not do. She could have nominated a future date for delivery of a writen judgement with her reasons on that day of her judgement which she also failed to do. More important than any other aspect of her scandalous conduct from the bench Bee Lian Lau J’s decision is a departure from convention, civil procedure and the Constitution, in that she does not provide or refer to any precedent, law, power or authority she may have relied on (apart from selective and distorted readings of the Constitution) apart from a cursory reference to articles of the Constitution to draw the outrageous conclusions she came to in her judgement. Malaysia’s political woes appear to have its genesis in its courts and in a shallow and inexperienced legal profession. It would do itself a huge favour by encouraging the entry of foreign legal practices and legal practitioners from other commonwealth jurisdictions, a move which could only serve to enhance the quality of its lawyers and the bench. The clergy of Malaysia’s Catholic Church enjoys a kindred spirit with it judiciary and its legal profession. Acceptance to the vocation of priesthood is often less on merit than it is on the patronage of Bishops and parish priests who weild more than termporal and spiritual power on their faithful’s unquesitoning loyalties to them. The world body of the Church in its diversity appear to have moved on but not the poor second cousins in Malaysia. Father Lawrence Andrew a Jesuit (an elite of the Catholic Church’s many religious orders) and his Bishop Pakiam may have been taken for a ride by over ambitious lawyers from the Catholic lawyers association who ought to have known better about the issues the Church faced in this unwinable battle they embardked on. Fr. Lawrence (not much about Pakiam) according to a BBC reporter who interveiwed the man over a year ago is by all accounts and honourable and honest advocate of the Church’s interest in an environment as volatile as Malaysia is on matters of religion, race and culture. His legal advisors could have advised him to moderate the position of the church to one more closely reflecting its theological and moral position than for them to have allowed the issue to develop into a lawyers picnic complete with media circus and inflammatory remarks upping the ante at each stage to reach such an unfortunate watershed in inter religious relations in Malaysia. The position of the Church has not been aided in any way by an incompetent and illogical decision by Bee Lian Lau J. It has merely served to further alienate the Church from that sector of the community injured by the Pontiff’s caustic and unwarranted remarks about their religion being ‘the most evil’ in recent years. FR. Lawrence will eventually be left out to dry by the legal team that are we believe to be at the core of this misadventure by the Church. His Bishop by all accounts is reported to be a man of similar character make up as the lawyers. Congratulations grkumar on an excellent argumentation of aspects of Malaysian Constitutional Law and one “learned” Malaysian judge’s judgement! Being trained in linguistics I see the issue as one involving semantics and the translation of a key religious concept – GOD. The word for the Muslim concept of God (Allah) has been transposed or borrowed to represent the Christian God in the Bahasa Indonesia translation of the Bible. Cultural and religious concepts are the hardest to translate and often the most elusive. 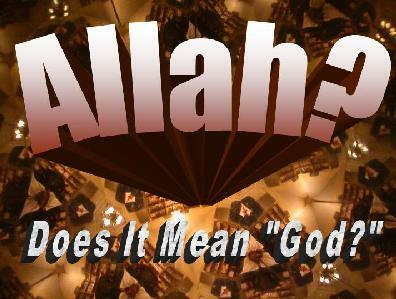 Many words like “Allah” are culturally loaded and have evolved in the holy books and its teachings among the followers. They are often embellished and reinforced by their sociolinguistic environment and have acquired specialised contextual meanings. In the lexicon of a language some words have a direct, referential/ denotative meaning – the most obvious being a name. “Ali” refers to the person of Ali. Others have a referential meaning as well as a connotative/ implied meaning e.g. “pig” refers to the pig (animal) but it can be used to imply the pig’s characteristics such as “gluttony” in “You are a real pig”. “Allah” is a culturally loaded concept in Islam both in the language of the Quran and the language of its Malay Muslim adherents. It is imbued with many meanings including the 99 attributes of God familiar to the Muslims. To justapose “Allah” in the culturally distinct Christian milieu is to translate what is basically an untranslatable concept – both of the unity in the Muslim understanding of God and the trinity in the Christian conception of God. Isn’t this in itself confusing? What the “learned” judge has done is to confuse the adherents of the two faiths further. In translation theory there is the notion of “untranslatability” and when a concept is untranslatable the translator resorts to employing the generic term supported by notes or an explanation. Why cause the confusion and now the tension when the generic Malay word for the concept of the universal God “Tuhan” can be used? grkumar – I would be very interested to know how a linguistic argumentation can be incorporated into the constitutional one. You are more than welcome to cut and paste whats written here. Welcome to our world. There is much to compliment you on in your comment here. Within what you have raised in your comments are matters the Church ought to have considered before embarking on their crusade on the word Allah. The state has no case to answer for the very powers and rights conferred on it in the constitution. Like linguistics, the constitution itself cannot be understood unless one has a background in jurisprudence and constitutional hisstory within the commonwealth (in our case) and the writings of great constitutional and jurisprudential minds from Austen, Bentham, Blackstone to Bork and Posner and even Blackshields. Unfortunately we have too many text book lawyers who read to pass exams then go hell for leather in developing a business in an unregulated environment. Continuing Intellectual and professional development are never on their radars. The outcomes are the the mess we are faced with today. The devil as they say is often in the detail. And that cannot be understood or understated when one translates language or cultural expressions from one environment with a completely different history and culture to another of a completely different culture with the diversity that Malaysia is. It is a recipe for disaster unless much thought is given to whats being done with all outcomes in mind. The Bible itself in the initial Gospels come from Aramic, Greek and Roman to Hebrew, Arabic and so on and so forth. Along the way much may had been lost and much more the subject of interpretation and revision for political expediency by conquerors and colonialists and other despotic opportunists along the way. A crude example of how translations can be terribly funny or offensive is the one I use everytime I visit Malaysia to stress the point you make about “untranslatability”. I order an “anging panas” (Hot Dog) from food vendors who look aghast first then laugh at the idiot asking the question. I learned this from my legal advisor also from Malaysia and use it just to prove a point. Literal translations in this case on the word of god (we as mere mortals have no right to translate it) are a lesson in disaster. Although not an area or topic of dicsussion I am able too comfortable with or can confidently comment on, I think it is one of the mysteries of the ‘tower of Bable’ syndrome we are faced with here. I am glad you have decided to visit and to read. An excellent piece. Not being a lawyer, I can’t say much about the legal argumentation. But I’m very impressed by the arguments Mr Kumar puts out. I assume he is a lawyer. If he had represented KDN, the decision might have been different. I wish our DPPs are of the same calibre as this man. I myself have been wondering why the Judge had not recused herself. Or at least declared at the hearing her Christian background and her being active in Christian religious activities. In the absence of any written judgement from Bee Lian Lau J. it is just unfair for anyone to pass comments based on her verbal judgement, by relying on documents from media or other unreliable sources. Whatever her religious conviction should not be an issue here as she acted, I believe as a High Court Judge, void of any influence from any party. Wouldn’t it be better, as matured citizens, we wait for her written judgement before we comment? We are not helping to reduce the tensions by harping on this issue based on these unreliable documents. Let us get the facts right first and then, if really she has erred, to comment on her judgement. Further as we know the decision of the High Court is subject for appeal to the Court of Appeal and the Federal Court. The main issue today is why are we taking the law into our hands? Leave it to the government to handle it through Inter Religious Council discussions or right up to the Apex court. Socalled NGOs should calmly wait, as matured true Malaysians, and not allow the situation to get out of hand or increased the tensions. Saying “taking the law into our own hands” is not helping either. We follow the advice given by the authorities – like the police – not to spread rumours, speculate on the culprits etc, but even Minister Nazri made a comment on the issue. I’m quite prepared to listen to the advice of reliable lawyers on what constitutes subjudice but so much are being discussed on the Court ruling that it appears to me quite acceptable to talk about it. Until there is authoritative advice on this matter, I think people can give views that may be helpful in the further conduct of the case, so long as they are not prejudicial to Police investigations, subverting law and order or seditious. Right now I need to know why was there no written judgement, what actually are the rules about it and are what have been said by Gopal Raj Kumar concerning written judgements correct or not. The views of a lawyer would be appreciated. It’s OK in the context of fair comment. In Latin it’s called per incuriam. It’s allowable for academic discussion. Where the judgment fails to refer to the relevant statutory provisions, one’s comment could begin with the wordings “With all due respect to the learned judge”, etc. In the past, written judgment was done only when there is an appeal on the matter. There’s no hard & fast rule on written judgment, none that he knows of. A judge is only required to pronounce the judgment in court & record it on the notes of proceedings before him in the court’s file, that’s all. That’s no need for him to give his reasoning. When there is an appeal, the judge has to prepare the written judgment giving grounds and reasoning for the judgment. This is because parties to the appeal need the judgment to be included in the record of appeal. But nowadays, maybe there is an internal circular within the judiciary on the same for good measure and for record purposes. I’m reviewing my stand in the light of the above. I think the issue is whether there is any malice intended. There’s no malice in the discussion here. We are interested in what is right and what is wrong. Understanding the issue fully helps promote goodwill and harmony. However, I welcome the views of any other lawyer. Directly or through any one of us here. Cheers. Just to be clear – the above views are in respect of commenting on the Judge’s decision before the appeal is heard. Thank you harum manis for doing that bit of research. “It is traditional that British and Canadian appeal courts render many judgments orally, in open court. Although this format may seem foreign to American judges and jurists, it is a practical and efficient tool for rendering decisions and disposing of cases. The American legal system would fare well to consider the advantages of oral judgments. The oral judgment practice in the Canadian appellate courts. Literally translated as “through lack of care”, per incuriam refers to a judgment of a court which has been decided without reference to a statutory provision or earlier judgment which would have been relevant. The significance of a judgment having been decided per incuriam is that it does not then have to be followed as precedent by a lower court. Ordinarily, in the common law, the rationes of a judgment must be followed thereafter by lower courts hearing similar cases. A lower court is free, however, to depart from an earlier judgment of a superior court where that earlier judgment was decided per incuriam. The Court of Appeal in Morelle Ltd v. Wakeling  1 All ER 708,  2 QB 379 stated that as a general rule the only cases in which decisions should be held to have been given per incuriam are those of decisions given in ignorance or forgetfulness of some inconsistent statutory provision or of some authority binding on the court concerned: so that in such cases some part of the decision or some step in the reasoning on which it is based is found, on that account, to be demonstrably wrong. In R v. Northumberland Compensation Appeal Tribunal, ex parte Shaw , 1 All ER 268, a divisional court of the King’s Bench Division declined to follow a Court of Appeal decision on the ground that the decision had been reached per incuriam as a relevant House of Lords decision had not been cited to the Court of Appeal. Some academic critics have suggested that Polemis  3 KB 560 was decided per incuriam as it did not rely upon the earlier decision in Hadley v. Baxendale. In law, sub judice, Latin for “under judgment,” means that a particular case or matter is currently under trial or being considered by a judge or court. The term may be used synonymously with “the present case” or “the case at bar” by some lawyers. In England and Wales, Ireland, New Zealand, Australia, India, Pakistan, and Canada it is generally considered inappropriate to comment publicly on cases sub judice, which can be an offence in itself, leading to contempt of court proceedings. This is particularly true in criminal cases, where publicly discussing cases sub judice may constitute interference with due process. In the United States, there are First Amendment concerns about stifling the right of free speech which prevent such tight restrictions on comments sub judice. However, State Rules of Professional Conduct governing attorneys often place restrictions on the out-of-court statements an attorney may make regarding an ongoing case. Furthermore, there are still protections for criminal defendants, and those convicted in an atmosphere of a circus have had their convictions overturned for a fairer trial. The idea of sub judice (a breach of which is contempt) was originally created to prevent a jury from being infected or influenced by views of others (however authoritative these may be) when empaneled for a trial (criminal trials mainly). However rapid changes in circumstances and the character in media reporting the advent of electronic broadcast media including the net and the seamless world wide web have tended to erode and reduce the impact of such laws. There are valid defences to override a claim of sub judice and paramount to all is that of the public’s right to know and the public interest issues of the matter being complained of. The description of a co offender at large and any other information such as the dangers the fugitive poses to the public often involves disclosures elements of his co defendant’s offence whilst the matter is afoot. It would be technically sub judice but the law is required to balance its approach to a claim of subjudice with the real prejudice it creates against the right to freedom of expression/ free speech/ public interest and the right of the media to disseminate information to the public on issues of critical public importance. Thank you, ninitalk. Quite a mouthful to digest, not being a lawyer and lacking the penchant for detail. mind as a tool against subversion and am quite happy that, by and large, the authorities have not used it willy nally – though not sure what the amendments being proposed are. Overall, as yet another lawyer said in jest, the more the differences in interpretation, the more money lawyers make! I believe that the most important thing is the intent. No doubt the commission of the act and the act itself, however unintentional it may be, can be wrong. I’ll just go by no bad intention and hope that I don’t need the services of a lawyer if somewhere down the line of well-intended discussions my statements appear out of order. TAHNIAH. SAYA TELAH PAPARKAN DI BLOG SAYA BERKAITAN ARTIKAL INI. TQ ATAS PANDANGAN ANDA INI. Thank you Harum manis and Datin for enlightening me on the terminology ‘per incuriam’. As long as the discussions, specifically on this matter, do not incite public emotions or any malice intended on any party, I am all for it. A healthy discourse is always welcome. I think the commenters on ninitalk have been most responsible and articulate. Isn’t it amazing how much we’re learning by just engaging each other in meaningful discussion. There’s a great deal of respect for differing viewpoints because, as harum manis says. there’s no malice and our intentions are never meant to be prejudicial to national interest. And we hope that despite all the politicking and politics that’s going on, nobody really wants the country destroyed.Problems emerge because each of us thinks that our cause is the right one and we stick our necks out to defend it. That’s why there must be more forums (public and closed door)at all levels with representations from diverse groups. I’m always amazed at how much knowledge and experience people have which they are prepared to divulge if the approach is right. If we remain coccooned under our own tempurung we will remain bigoted katak-katak who are intolerant because we are so ill-informed. Contradicting press statements by our Ministers and the Opposition leaders do not help in dosing the fire of hatred between most of our brothers Muslims and Christians. They should just leave it to the PM and DPM to solve this sensitive matter in the most amicable way to appease both parties. As we know the matter is still pending the appeal by the Government to the Court of Appeal. Do not take advantage to politicise this serious matter but as true Malaysians we should all close ranks and leave it to the authorities to handle it! Formation of an INTER FAITH COUNCIL is one of the ways to end the matter, hopefully. This is where a Royal Commission on interfatirh and interreligious understanding is in order to consolidate the findings of the courts, Muslim and Christian religious leaders, the Inter Faith Council,NGOs etc! The politicians barring the PM and DPM should just shut up! I am probably a bit late in adding my 2 cents worth to the consequences of my posting here on Nini talk my criticisms of the Bee Lian Lau judgement on the “Allah” matter. Commentary on a particular judgement need not be subject to any appeal. The criticisms I made about Bee Lian Lau’s judgements are not unique to my personal perceptions of her conduct or my interpretation of the law in the matter or of the part she had played in it. By her decision to accept to sit to adjudicate the matter in the first place, a matter so controversial and prone to conflict with her religious beliefs as a practising evangelical proselytizing fundamentalist Christian, it beggars belief a judge of her calibre would not have been aware of the very real rather than perceived threat of bias. As such she should be spared criticism for her poor judgement in this regard. The same criticism must also be made, albeit in hindsight, of the AG (the DPP) and the lawyers acting on their behalfs in the matter. One can only wonder what would have happened if a Muslim judge of the fundamentalist variety was given to sitting as an individual single judge of the High Court to hear the same matter then arriving at a different judgement to Bee Lian Lau and with diffferent reasons for his judgement. For arguments sake lets assume the Muslim judge would have arrived at a conclusion similar to the conclusions I have drawn in my criticism of Bee Lian Lau. There is an awful amount of intellectual dishonesty amongst so called intellectuals in Malaysia which makes one wonder whether each of these conflicts Malaysian soceity is suddenly subject to in the post Mahathir era is generated by opportunists operating in a legal vacuum for the purpose of creating divisions in order to achieve some other political purpose in an otherwise tolerant and secular society.